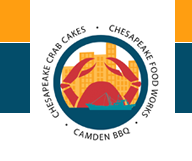 Chesapeake Food Works and sister catering company, Camden BBQ, have paired up to become your official event creators. With over 50 years combined catering experience, top of the line staff, and quality that is unmatched we promise to not disappoint. We are thrilled to announce that you can now order your crabcakes online! Click here to place your order!